Kowloon [Hong Kong], Nov 14 (ANI): Ace Indian shuttler Kidambi Srikanth kick-started his campaign at the ongoing Hong Kong Open on a winning note as he defeated Wong Wing Ki Vincent of China in the men's singles event here on Wednesday. Not breaking much sweat in the match, the 25-year-old swept aside his Chinese opponent 21-11, 21-15 in their opening encounter. Srikanth gained the initial momentum in the match as he registered a convincing victory in the first game. 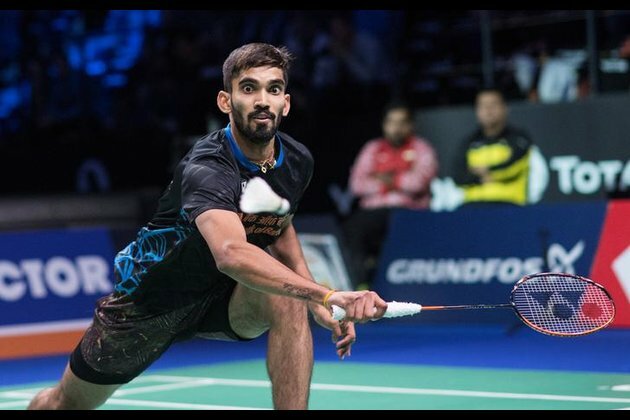 With a total of seven consecutive points to his name, the Indian shuttler raced way ahead of Vincent who could only manage to secure two consecutive points in the game. The second game did not bring any sort of respite to the Chinese shuttler either as the Indian dominance continued. With the help of some smashing rallies, Srikanth easily won the second game 21-15. Overall, the Indian shuttler won a total of 42 rallies in the match as compared to his counterpart's figures of 26. Another Indian shuttler Parupalli Kashyap, on the other hand, failed to advance further in the tournament as he stumbled to a straight-set defeat against Anthony Sinisuka Ginting of Indonesia. Making a promising start against Ginting, Kashyap could not continue with his upward movement and lost the match 16-21, 13-21. In women's singles event, Saina Nehwal lost the closely contested match 21-10, 10-21, 19-21against Japan's Akane Yamaguchi. Winning seven consecutive points each in the match, both the shuttlers looked promising. But the difference in the rallies won by the two shuttlers costed Nehwal dearly. While Yamaguchi won 52 rallies during the match, Nehwal narrowly missed the edge with 50 rallies to her name.